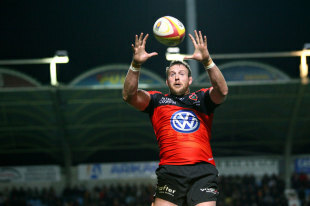 Worcester have acquired the services of former England lock Dean Schofield from Top 14 side Toulon, with the forward returning to the Aviva Premiership for the start of the 2012-13 campaign. The 33-year-old spent nine seasons with Sale Sharks before heading to France, captaining them during the 2009-10 season. Schofield made his England debut against South Africa prior to the 2007 World Cup, and he will move to Sixways in time for next season. "Dean will add more physical presence and power to our pack of forwards. We want to go for a big pack next season," Worcester head coach Richard Hill said. "Dean is a big man and a powerful man who is also quick and has superb skills. When he plays he stands out in the pack of forwards. He is all-action and brings his presence to the close quarters." Schofield told the Worcester Standard: "I have been lucky enough to play with some quality players at Toulon and I have certainly learnt a few things. I think the experience has been hugely beneficial to me. "I am looking forward to the move. I spent nine years in the Premiership with Sale Sharks and I always hoped to be able to come back again."